Tun·gus·ka (toon goosˈka) n. any of three rivers (the Upper, Stony, and lower Tunguska rivers) in central Siberia, flowing westward to the Yenisei River. The forest was a forest and the river was a river. That is until the day the forest flattened. I was sleeping in the hut with my brother. Somebody shoved me and I awoke. My brother had been shoved too. But no one else was there. We heard the whistling and felt a strong wind. Brother said, “Can you hear all those birds flying overhead?” And I heard the sound he meant: the echo of thousands of wings flapping against the air. We stepped out of the hut but the sound was not birds. I saw the sky split in halves, high and wide over the forest. The entire northern side of the forest covered with fire. The forest flattened, as far as I could see, trees red with ember leaves. The split in the sky grew larger. Suddenly, I became so hot I could not bear it, as if my shirt was on fire. I wanted to tear off my shirt and throw it down, but then the sky shut closed, a strong thump sounded, and I was thrown. After that, such noise came. As if rocks were falling or cannons were firing. A thunder like I’d never heard. I was shoved again and fell into the fire. We got scared. We cried out, for our father, our mother, our sisters, our brothers. But they didn’t seem to hear. The earth below us began to move and rock, wind hit our hut and knocked it down. My body was pushed down by sticks, but my head was clear. Then I saw a wonder: the sky became bright—how can I say it?—as if there were a second sun. My eyes burned from the way it blazed. Brother said, “Look up” and pointed with his hand. We watched the treetops get snapped off. Another flash, another thunder. We were knocked off our feet, struck against fallen trees. In the air where the flashes had been, a blue cylinder, a billow of smoke. We thought sure it was the end of us. Then, suddenly the sky began to clear. There had been five of them. The thumps. No, six. Now I remember well there was also one more, but it was small, and somewhere far away, where the Sun goes to sleep. * Words and images from this piece taken from multiple eyewitness accounts of the a powerful explosion called the Tunguska Event, which took place in 1908 near the Tunguska River in what is now Krasnoyarsk Krai, Russia. While the cause is debated, the most popular explanation is that the explosion was caused by an air burst of a small asteroid or comet five to ten kilometers above the Earth’s surface. 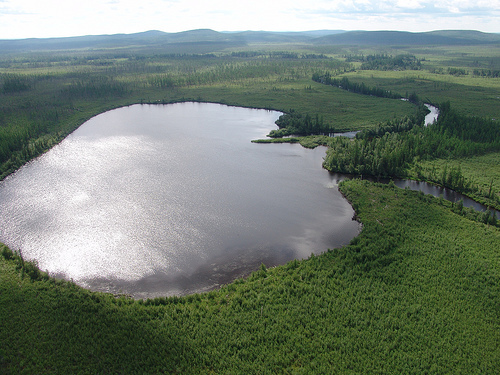 Lake Cheko: In June 2007, scientists from the University of Bologna led by professor Giuseppe Longo identified a lake in the Tunguska region as a possible impact crater from the event. 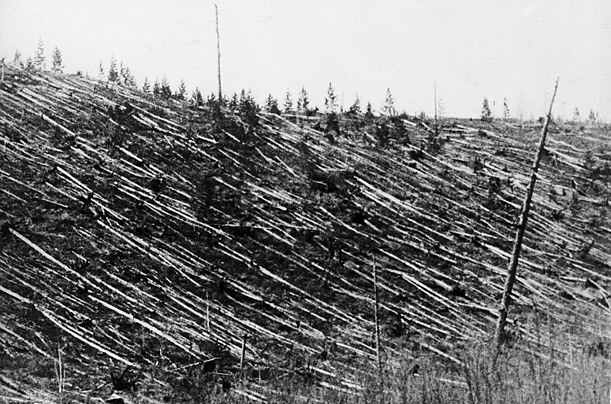 They do not dispute that the Tunguska body exploded in midair but believe that a one-meter fragment survived the explosion and struck the ground. Pollen analysis reveals that remains of aquatic plants are abundant in the top post-1908 sequence but are absent in the lower pre-1908 portion of the core. These results, including organic data, suggest that Lake Cheko formed at the time of the Tunguska Event. Consign: v.tr. (often followed by to) 1) deliver to a person’s possession or trust. 2) commit decisively or permanently (consigned to the trash can).3) transmit or send(goods). I feel moved to write this regarding the situation in Syria. There are aspects of this that feels so familiar. Once again the world finds itself in the place of having to choose between two awful responses to what is happening. On the one hand we can watch what happens (in horror) and allow it to continue, or we can take action which very well may not resolve the issue, and may actually exacerbate the problem. The country in which I was born and in which I presently reside, is having to face up to the fact that the days of America being able to resolve issues around the world, no matter how atrocious they are, by exercising our national will, have long since passed. Before the decision to engage militarily is made and therefore consigned to the history books, it feels to me as if the decision to seek congressional approval is what is called for, if only to allow the time needed to have a vote and to let some conversation occur about what specific actions will have the most beneficial and effective results. Of course, the question can be asked “Why are we starting this process now, when it seems obvious that this crisis was heading in this exact direction”? That question seems to always be the one that needs to be asked. I have no answers, and can only weep for the suffering that is taking place. I hope that the rest of the world consigns itself to action that can most effectively alleviate the pain and suffering that is being experienced by the Syrian people. May wisdom and foresight prevail. Shanti, Shanti, Shanti. Thank you for this thoughtful reflection, Bob. I too have been deeply saddened about all the suffering of the Syrian people. And deeply afraid of any military action we will take, as I don’t believe it will help. “May wisdom and foresight prevail.” That is my hope too.